THREE TURBOCHARGED PETROL and three turbodiesel Euro 6 engines are available now, ranging from the 184hp 220d turbodiesel to the latest 326hp M235i high-performance model priced at �,250. In due course 228i, 220i, 218d and 225d engine options will join the line-up. All engines will use BMW's TwinPower turbo technology and their acclaimed Efficient-Dynamics to reduce fuel consumption and lower CO2 emissions. The new Coupe is enhanced with a higher level equipment tally as standard and there's the choice of four trim levels: SE, Sport, Modern and the best-selling M Sport plus the specific M235i variant and, of course, there's the usual wide range of extra-cost options to choose from. BMW say the new Coupe is their first-ever 2 Series model. True in part, although in the late-60s and mid-70s they had the 2002 range of saloons and coupes which in due course became the 3 Series. The 2002 included the infamous Tii Coupe version with BMW's first-ever use of a turbocharger  and by all accounts the power it offered far outperformed the car's handling capabilities. Much has moved on and today's 2 Series Coupe is a far superior machine  even better than the 1 Series Coupe it replaces. Most importantly, the long front bonnet, elongated length, heavily sculptured two-door body and longer wheelbase with wider front and rear tracks give it a much stronger road presence than the '1'. The overall length is 4,432mm (72mm more than the 1 Series Coupe); the wheelbase is 30mm longer; the width is 26mm more; and the front track goes up by 41mm and the rear by 43mm. These increases in turn boost rear legroom by 21mm and the boot  still not large and with an awkward opening  is now 390 litres, which makes it 100 litres larger than that of the current Audi TT Coupe. The rear seats split and fold to release further load space. Rear seat passengers will appreciate the extra room but it is still not large enough to be anything more than adequate and not, in fact, as practical as the 1 Series Hatchback. But it looks a more high-performance machine  one well in tune with BMW's sporting image. All versions, except the stunning performance M235i, are available with SE, Sport, Modern and M Sport levels of equipment and all versions offer more spec for minimal price increases over the 1 Series versions. The actual increases range from �0 to �5 but then the added standard-fit iDrive Controller and BMW Emergency Call feature alone are worth �0. The standard SE spec is generous and includes 17-inch alloy wheels, rear parking sensors, high quality DAB radio with a 6.5-inch monitor, climate control, Bluetooth, rain-sensing wipers, auto lights, Dynamic brake, traction, brake cornering and automatic stability controls, front fog lights, engine start button, on-board computer, auto stop-start and brake energy regeneration. The front cabin remains a typical driver-focussed cockpit arrangement with most controls being well positioned; only the start button is not immediately visible, being masked by the rim of the steering wheel. The iController is positioned on the centre console and is really easy to use for all its various functions, especially the �890 extra-cost but highly desirable BMW Professional Navigation System. The '2' Coupe's handling is brilliant: sharp and agile; and the steering gives really accurate feedback. The wider tracks keep the Coupe well planted during cornering and understeer is hardly evident except for really aggressive cornering, but for most drivers the car turns-in nicely and predictably. 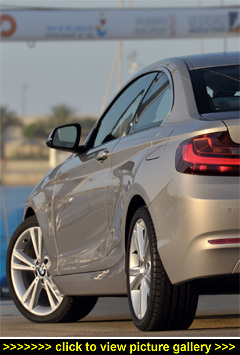 With the 17-inch wheels the ride comfort is good and the longer wheelbase has ironed out some of the fore-to-aft choppiness of the 1 Series Coupe. There is the usual Drive Performance Control with ECO PRO, Comfort and Sport modes easily selected using the toggle switch set close to the gearlever. The 220d, four-cylinder turbodiesel engine we know well enough, being BMW's best-selling unit with 184hp and, more importantly, 280lb ft of torque delivered from under 2,000rpm  ideal for either relaxed or vigorous driving. The top speed is 143mph and zero to 62mph takes 7.2 seconds with the six-speed manual 'box. When it comes to fuel economy, 58.9mpg is the official Combined Cycle figure and during my hard and fast test drive on the winding, mountainous and traffic-free roads of southern Spain, the 220d SE Coupe returned 43.1mpg. With CO2 emissions of 125g/km (manual 'box), road tax is waived for the First Year and thereafter is only �5 per annum. Company car drivers will pay 21% Benefit-in-Kind tax from April. While the new '2' is undeniably roomier, rear seat leg and head room is still limited. However, on the plus side it comes with more upmarket status, more interior space, a larger boot (albeit with a boot opening that's a tad on the tight side), a higher spec, and more fuel- and CO2-efficient engines  and it's great to drive.